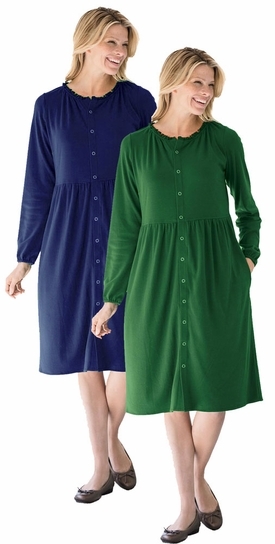 Our plus size snap-front dress has supreme comfort with an easy, relaxed fit. Just put it on and go everywhere! Relaxed fit offers roomy, cling-free wear, falls to mid knee. A ruffled scoop neck keeps you cool and airy while remaining bra friendly. A front placket with snap closures for easy on/off. Shirred below the neck and empire waist seam for fullness and comfortable, easy movement. Long sleeves with loose elastic provide perfect coverage. Feminine bust darts, handy side-seam pockets. Soft washable polyester/cotton interlock, USA and imported. 5x: Chest= 62/66", Hips= 64/68"
6x: Chest= 66/70", Hips= 68/72"